HELP: Rockerverb 100 MKIII into (2) PPC412; best connection? OK. I've got my RV100MKIII and the two cabinets are both Orange PPC412 (one angled, one straight) and I've read the manuals and everything but I don't like new generation way of labeling the speaker outputs (which is not reflected in any official documentation) on the back of the MKIII. It doesn't look like any of the other models that I've seen and it just makes me nervous. Maybe its all the same but it just doesn't add up to me. Now, should I be going out of the jack all the way to the left of the speaker output section there? And then should go out of the unused jack on the back of the first cabinet into either of the two jacks on the back of the second cab? Should I use the middle jack on the speaker output section of the head? Should I go from one of the two 8Ohm output into one cab and then out of the other 8Ohm output directly to the second cab? How exactly should I do this. I just got the new cab today and don't want to dollywaggle anything up. This is my first experience hooking up a double 412 rig. Its rather pathetic but I'd rather be safe than sorry. I apologize for what must be a no-brainer but the fact that the first two outputs are double labeled as "1 x 8" AND "2 x 16" at the same time is simply derailing my confidence in understanding what I'm doing. Re: HELP: Rockerverb 100 MKIII into (2) PPC412; best connection? If you run only one of your cabs, it goes into the 1x16 jack. If you run both cabs they each go into an 8 ohm jack under the 2x16 label. 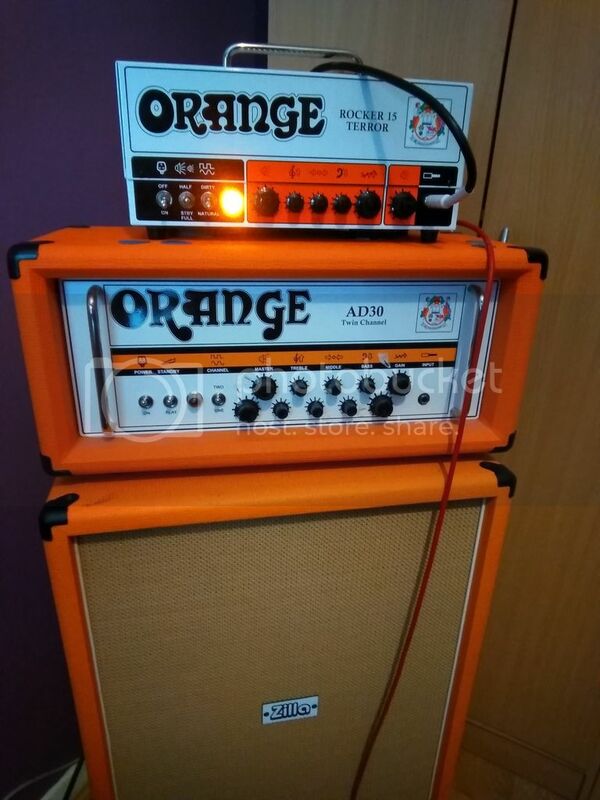 Yep there's only one way to do it and it's the same as all the orange valve amps, you'll need 2 speaker cables and from each cab plug into each 1x8 /2x16 ohm outputs. Each cab is 16ohm. I'm thinking orange have labelled it this way to make it easier to understand! Normal these outputs are labelled 1x8 ohm . Ok. Thanks. I saw someone say in another thread that the cabs could be essentially daisy chained like 8Ohm output to the first cab then unused cab jack from the first cab with another speaker cable to the second cab. Yes that would also work. When did the back plates look like this?? Mine looks way different for labeling. For the last few years or so. Does your RV have notched control knobs? Yeah, the knobs have the detents. Mine has a more traditional back plate.